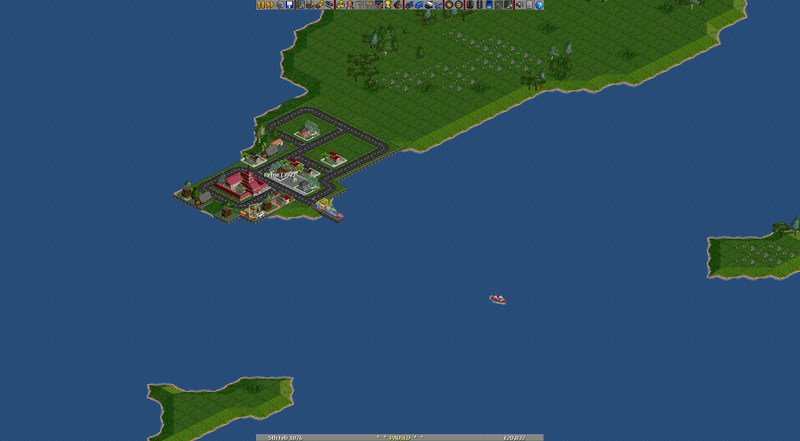 [OpenTTD] The Photo-Lab. LabUser's Screenshot Thread. 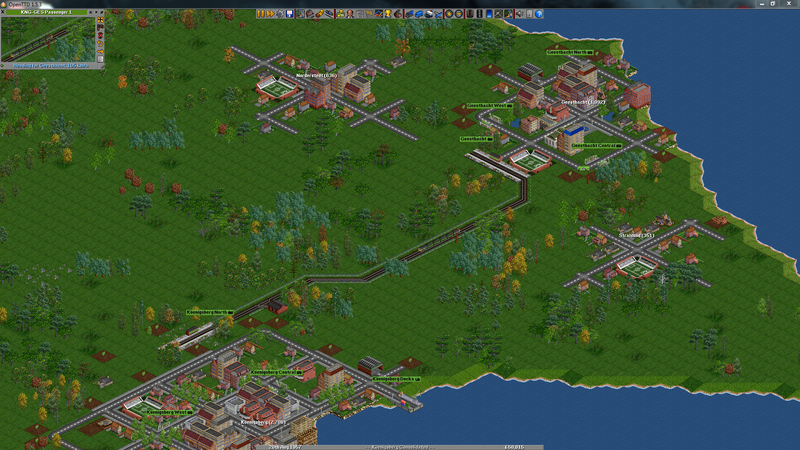 Post subject: [OpenTTD] The Photo-Lab. LabUser's Screenshot Thread. Skip to NEW content HERE. Willhelm Schulz, a native entrepreneur of Köenigsberg, scraped together enough capital investment to start a modest transport company. Frequent petitioning of the city council allowed a relaxation in the strict zoning controls for new construction, and the growing residential population allowed a limited passenger service to be opened to nearby Geesthact, which was swiftly followed by further expansion to incorporate Norderstedt and Stralsund as well. Heavy expansion was undertaken to add services to Wilster, and the increased capacity from the existing coal mine requiring additional engines and platforms to be built. Investing in new industry, an Oil Refinery was funded on the coast near Bremerhaven, and a loan taken from the national banks allowed a sizeable fleet of tanker ships to be commissioned to service the burgeoning local oil rigs. The loan was quickly repayed in six months from the profit these tankers returned. By 1980, electrification of the rail network had been completed. A small helicopter fleet had been introduced to service workers to and from the oil rigs nearby, and several new branch lines were added to the rail network. That was about where I'd gotten to before I wanted to start playing around with some more newgrfs and settings. Yes, I have turned off road building for towns, and I've found that buying land at the end of the roads is easier than demolishing buildings when I want to come back and extend the roads later. I have since discovered the Grassy Knoll grf which will make it less of an eyesore in future screenshots. 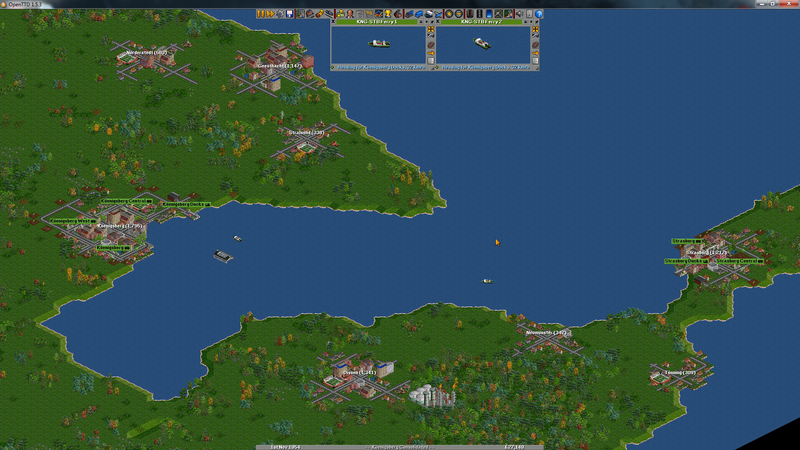 This was the first game I'd ever bothered to take screenshots of as it progressed. I believe the only grf that I was using at the time was a German town names pack. My junctions were not massively clean, and I made improvements during play, but I believe my building style has certainly improved since then and hopefully will continue to improve. Last edited by LabUser on Fri Feb 24, 2017 5:07 pm, edited 3 times in total. 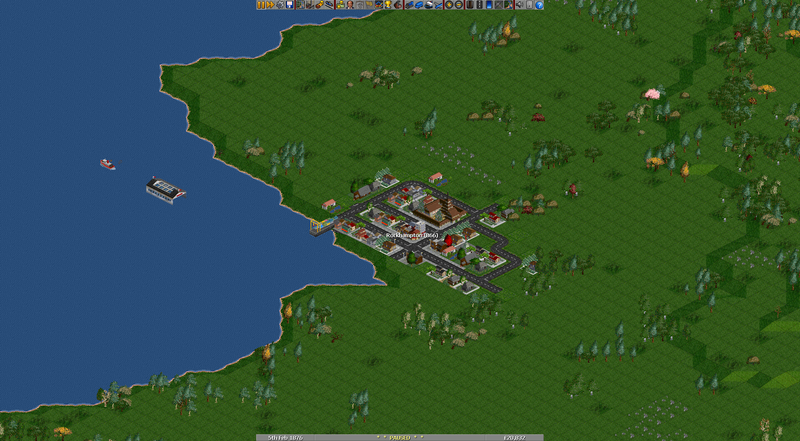 Post subject: Re: [OpenTTD] The Photo-Lab. LabUser's Screenshot Thread. These are all nice. You know, there is an in-game screenshot function though. Under the question mark up top, select Screenshot. This next set makes use of many of the Japan Set 3 grf packs and a slight tweak using OpenGFX+ Industries. 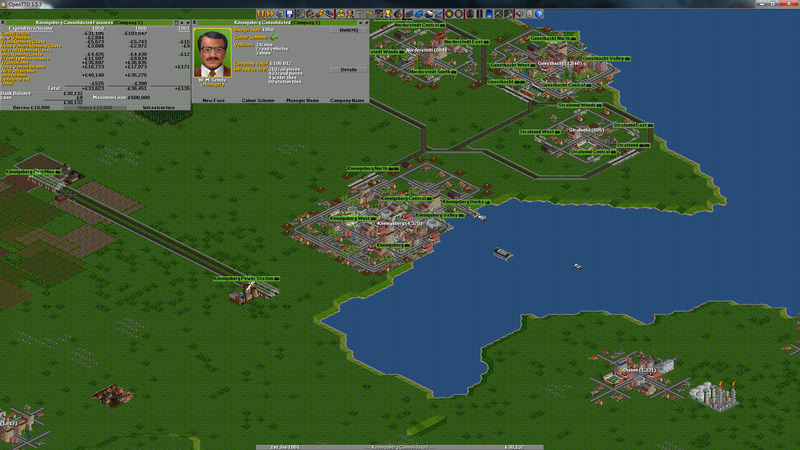 The year is 1872 and a foreign consortium has invested in a mineral freight network in the Komoro peninsula. Two iron ore mines and a copper mine are supplying raw materials to a factory, which in turn is delivering goods to the city of Iwakura. A fleet of 5000 B-1s was purchased to carry the ore and steel, but insufficient funds remained and two 1501-Bs were considered adequate to carry the goods shipments. Close-up view of the Komoro Iron Ore mine. The other mining sites included in the network, and the Steel Mill. In the rush to get trains into service, the goods line was not researched to Operational Standards, and so presents poor vectors for the trains acceleration rates. This is turn led to both Goods trains being scrapped, and a much more powerful 7010C being introduced for that leg of freight transit. In the interest of improving efficiency, some earthworks were completed at the Steel Mill site, allowing faster delivery of iron ore. Despite returning mild profits over the five-year period of its operation, the investors were not satisfied with their rate of return. Assets were sold as the company was folded up, and a tender was opened for a new transport contract in the region. Also a decisive factor in the removal of the previous Managing Director was a clerical oversight that cost a full year of operation after initial construction - all ten trains had been fitted with incorrect cargo wagons. I have a clean save of this map, and I plan to replay it soon. 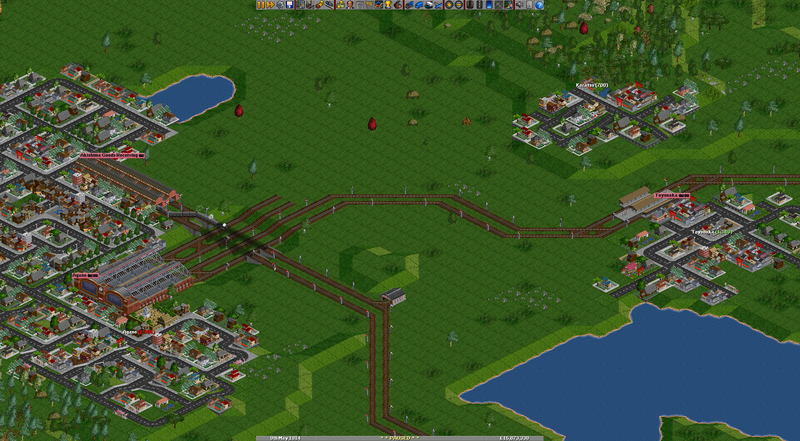 This game I was trying to set up a full service loop with all the industries involved, rather than the more traditional bulk coal haulage, but I might have to postpone that for after an effective operating platform has already been established. I'm also trying out Joker's Patch Pack (KeldorKatarn on these forums), and I'm wishing he'd made the taxation feature of his pack configurable instead of automatic. Anyway, more pictures soon as and when I can replay the map! 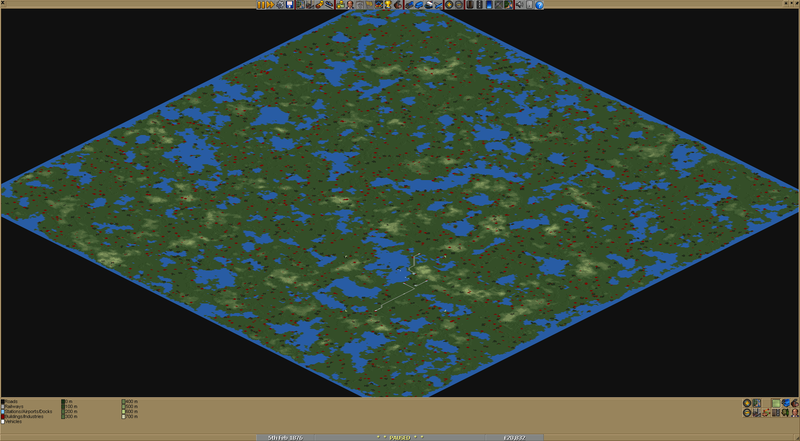 Okay, so on the same map as the last set, but a fresh start. Vowing not to make the same mistakes as their predecessors, the board of directors of the newly formed Akishima Coal company have prioritised heavy freight hauling from coal mines in order to maximise profits and pay down the initial debt faster. The initial network covered five coal sites, soon expanded to seven, and allowed 26% payback of the original investment by the fifth year of operation. Good signs for the company's foundation! A ro-ro station was decided upon for the power station, both because it allows to minimise the number of platforms required to service the network and reduces the waiting time of trains that are queueing for delivery. Several points have been identified where improvements can be made to the track network, but general improvements in engine power will overcome the worst of them with progressive upgrades as they become available. The first three mines in the network to be serviced. A fleet of thirteen 5000 B-1 locomotives were commissioned for service, with more than half servicing these three sites. 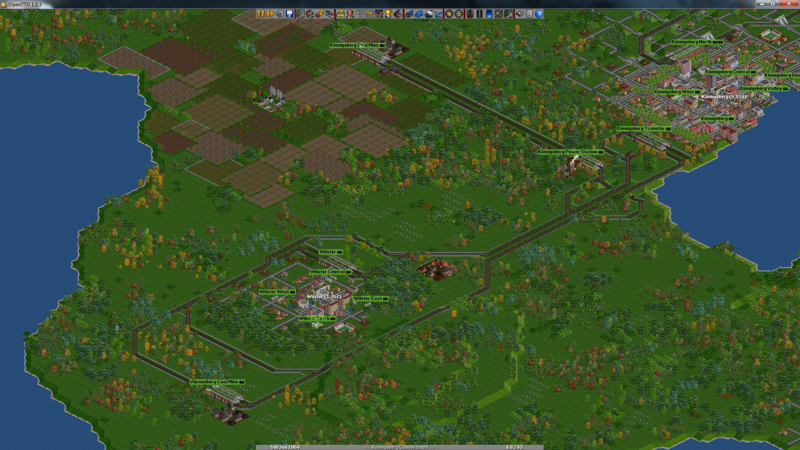 Another two coal mines, also being serviced by 5000 B-1s. It was initially planned to make a single station servicing both coal mines, but further analysis of the geometry of the land suggested separated platforms would still provide adequate service. The last two mines to be connected to the current grid. Kitamoto was part of the initial service launch, but Aizuwakamatsu was only added afterwards. Being a later addition the Aizuwakamatsu mine is being serviced by twin 7010C engines, and the lines to Kitamoto, Matsuzaka and Yamaga are being upgraded to the newly available 5130 2-B engines. 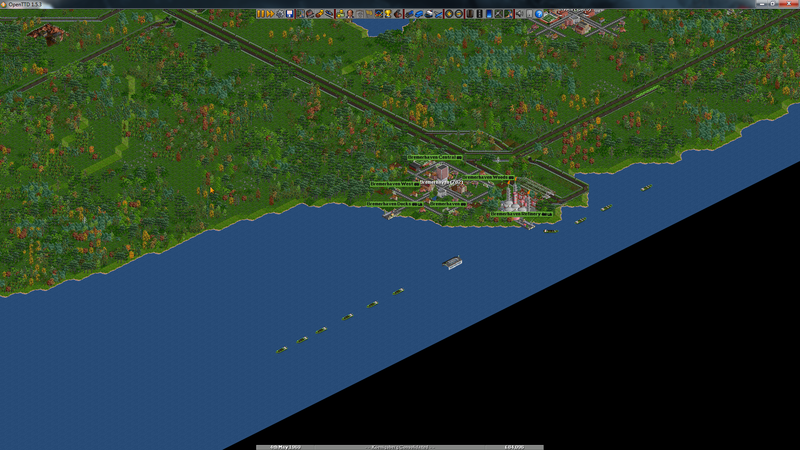 Things seem to be travelling along nicely for Akishima Coal so far, with several further expansions possible nearby. A study is also being conducted on several remote sites for independent operation from the main network. A separate review is also being performed on the feasibility of introducing passenger services, but the expected outcome is to postpone such plans. Thanks for the encouragement, I'll post more soon! An expansion line has been added to the west, past the Narita Mountains. A transfer station has been built to serve the four mines in the valley, with a relay leg to the main power station. The construction and new engine orders required the company to remortgage itself to the hilt, and concern was raised by the board of directors that this expansion was over-extending the company's reach. All fears were quickly set aside after the first quarterly fiscal reports showed a massive increase in profits. Arguments are continuing in the accounting departments over how much payment should be attributed to the trains serving the coal mines over the trains making final delivery. This is not expected to abate any time soon. Around 1880, the board of directors decided to branch out into oil carrying trade in addition to the coal lines. By 1890, tanker ships outnumbered trains 3:2, with a total of 64 ships in service. Balancing and accounting of the shipping industry is still being evaluated. Katori island is the site of an oil transfer station, servicing four nearby oilrigs. Kimitsu is the site of a second oil transfer station, servicing five oilrigs directly and also relaying from the Katori station to the refinery at Tondabayashi. During the decade where attention was firmly fixed on entering and expanding the oil shipping market, increased traffic on the rail network led to massive congestion around Fuefuki Power Station. Additional signals were added to the entire network, and a slight redesign on the junctions led to smoother operating and increased profits. The refinery at Tondabayashi, receiving from the shipping network and by train from the Sendai oil wells. Plans are being evaluated for adding a goods shipment line to Akishima itself. Greetings again! Sorry to spam, but I figure two update edits to my last post was good, and this is sort of a different subject/rant, so it gets its own post. While I'm sure the network design is far from optimal, I would have thought it would be sufficient for modest profits. Apparently this network was losing $40,000 per year. I had no idea what was going on. Was it just the slow trains? Was it the feeder leg payment adjustments I'd made? Not sure. Because I'd been playing on Joker's Patchpack, which can load vanilla savegames, I figured I'd load that game into vanilla and see if there was a difference in operation, but saves are not backwards compatible. 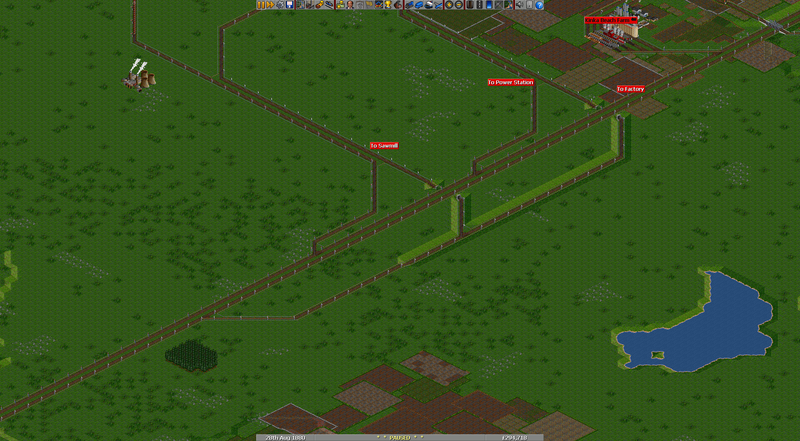 So I started a new game on vanilla, built the following rail network in the same year, and put ten trains in circulation. It was making about $150k per year. 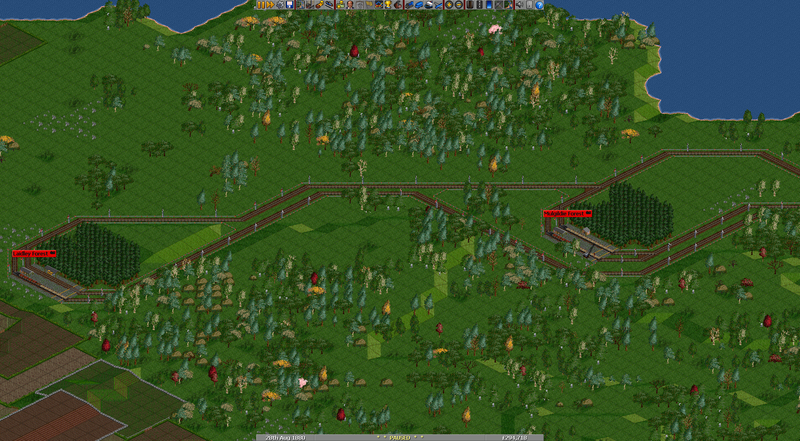 I then loaded the autosave into the Joker's Patchpack version of OpenTTD, and suddenly, suddenly its making maybe $5k a year, if that, and expenses are drowning it. 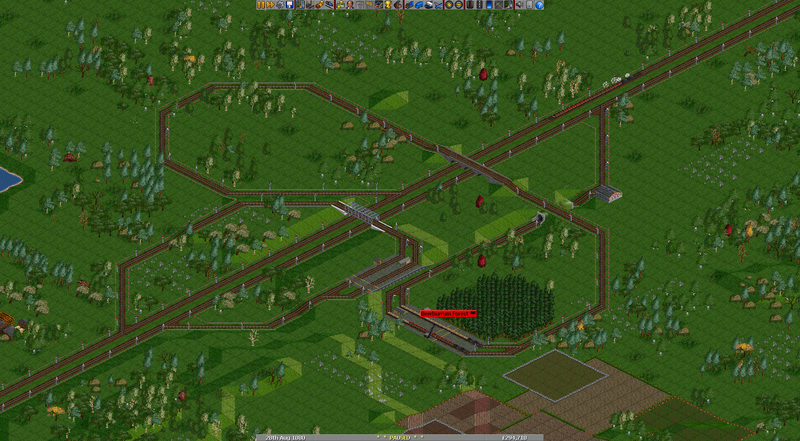 I have no idea what he has done to it in this regard, but it makes any sort of passenger game unplayable. Coupled with the rediculous taxation "feature" that he doesn't even let you turn off and has somehow piggy-backed into my vanilla OpenTTD game config, and I have to uninstall and reinstall a clean copy. So. I'm sure I'll be posting some more screens at some point. But I will most certainly not be playing with patch packs ever again. Vanilla all the way. Last edited by LabUser on Thu Mar 17, 2016 8:40 am, edited 1 time in total. These screenshots are looking great! By the way, don't worry about double or triple posting too much in your own screenshot, as it happens to most of us. Yeah, the taxes patch is probably what's killing you, in addition to also altering cargo payment rates and adjusting the station ratings patch. Just keep in mind that patch packs typically cater to what their authors are interested in doing rather than the general public. For a nicer patch pack that is geared for more sandbox-style play, check out JGR's Patch Pack or Tim's Patch Pack. No gotchas, just more fun tools to use and settings to exploit in your favor. Thank you Pilot. And Kamnet, yeah, it may also have been the station ratings on top of the cargo payments, but it just felt weird that it affected it by such a large margin. I guess I shouldn't say I'll never try another patchpack again, but I suppose knowing what I'm getting into and having better documentation will help. Ever since I first started researching and delving deeper into the game, I've been inspired by the excellent Warraweah Transport game from Paasky. I've tried and failed several times to start a game in a similar style, but I think its at least partly to do with trying to do too much, too quickly. So, I'm starting again and making a go of it. I'm using an unfinished naming pack that I'm still working on for actual town and city names from all across Australia (so far I've only finished Queensland, and I'm part way through NSW). I rolled up new maps until my hometown of Rockhampton was generated as a City with at least two receiving industries located in its authority area. A short ferry route has been set up to nearby Petrie, the first and only passenger service currently in operation. 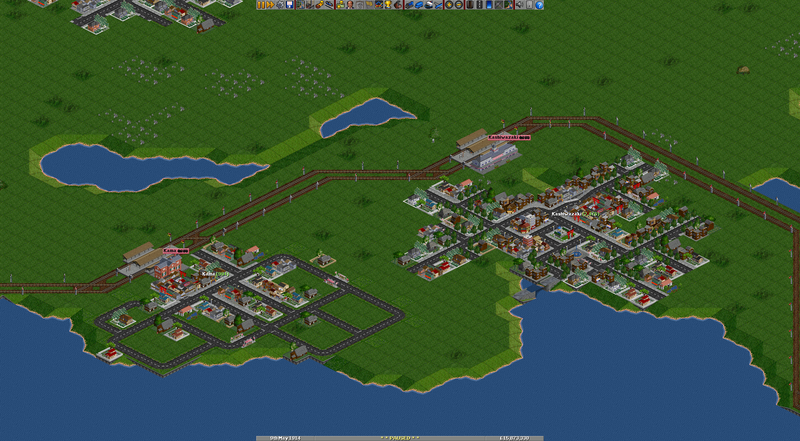 I do very much plan to service passengers to all towns and cities, within reason. 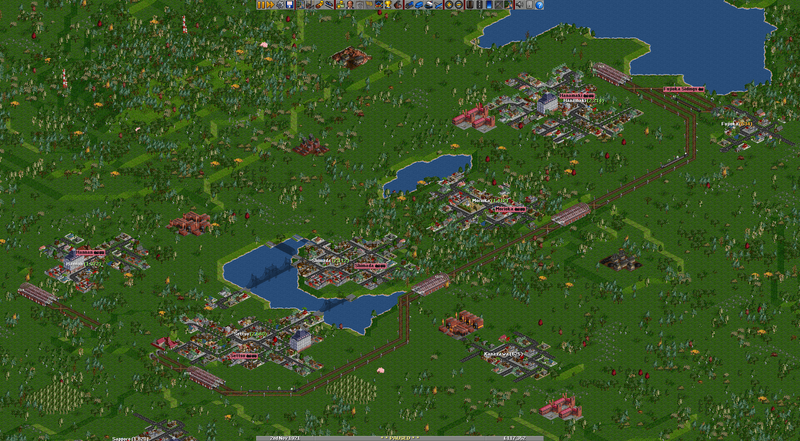 I'll also be founding new towns as satellite suburbs for major centres when cash allows. When the passenger networks are up and running, I'll be switching over to CargoDist for them. 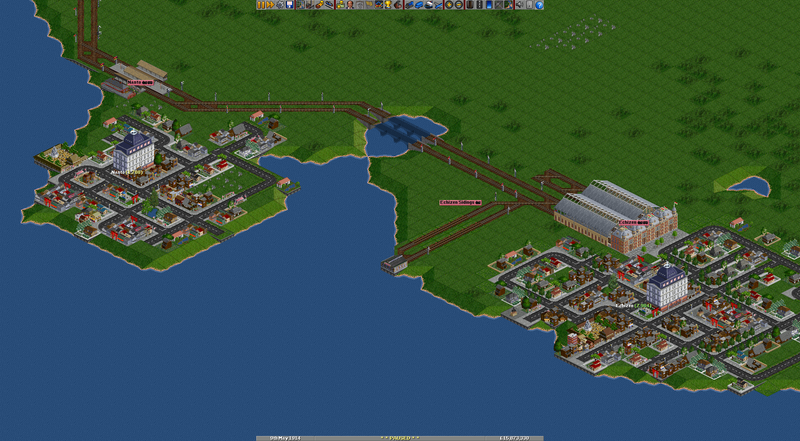 But that will be after the industrial lines are a bit more developed. Thanks for taking the time to look at my screenshots, and reading my dribble! See you soon for another installment! In the last two days, I've played, given up, deleted, and reloaded this save about six times. Maybe I should just play, not care about how ugly things get, and then fix them if/when anything actively breaks. So I'm mildly happy with some progress I've made tidying up what I've turned into a mainline coming from the south, branching to the Sawmill, Power Station and Factory from the same line. I'm not 100% sure where and how many relay/drop stations I'll have, but if the traffic starts getting too dense for a single line I can always double/triple it, or separate each cargo to its own dedicated line. Like I said before, I think I should stop thinking about these kind of decisions until its actually necessary. I was going with terminal stations originally because they have a narrower footprint, but I've been going with ro-ro recently to try and fit the terrain a little better. And last but not least, the relay drop at Beerburrum, in all its twisty glory. The Beerburrum trains have been extended in length, with a second engine to add better tractive effort. And a glorious loop because I felt like it, and its pretty. It's been a while since I posted a screenshot, despite lurking constantly. Between a number of other screenshot threads and re-watching ZestHusky's youtube channel, I've been inspired to post and try to keep playing a map for more than a couple of hours at a time. We'll see how successful I am at that! So after several hours of tweaking settings and NewGRFs, I have a setup that I'll run with. Without further ado, let's jump right in. A new transport company has set up operations headquartered in Kurashiki. Currently relying on imported locomotives, a 5500 2-B makes its way out of the station on the first, short-leg passenger route to be established. Also in shot is a proto-type motor coach returning with patrons from a nearby coastal village. Showing some of the surrounding terrain, it can be seen that work has already begun on extending the Hofu line further to the north. Being considered also are plans to branch the rail through Nagasaki along the south coast, and to implement broader bus routes to service the smaller villages nearby. After extensive cost/benefit analysis, it was determined that Nagasaki would present too many challenges and too great an expense to build a suitable rail platform to the town. Despite protests to the contrary, the townsfolk were forced to settle for a coach service shared with Fukuyama, linking to the Hofu rail station. 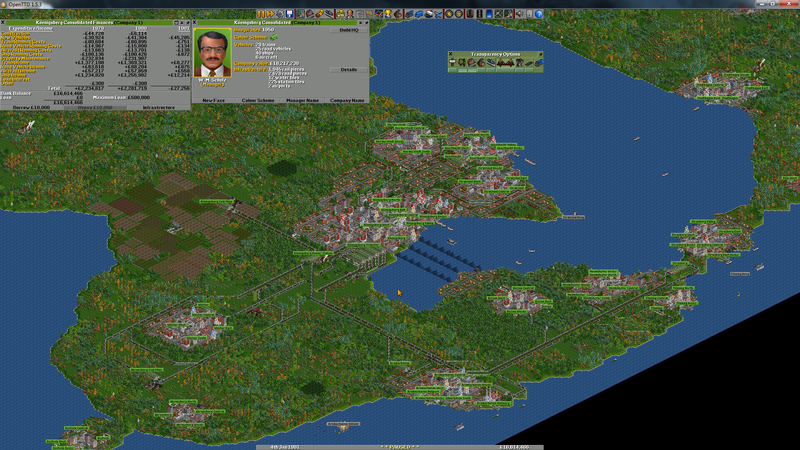 By contrast, the humble township of Sagamihara successfully lobbied to gain local employment and construction commence immediately for the proposed southern coast rail line. The solid silver Daibutsu is already proving a strong tourist destination, set to grow in stature in the coming months. As the company prepares to enter its third year of operation, KTC is in a strong financial position to continue its south-western expansion and begin paying down its shareholders' invested capital. The northern rail link through Hofu is on hold, pending approval applications before local councils. 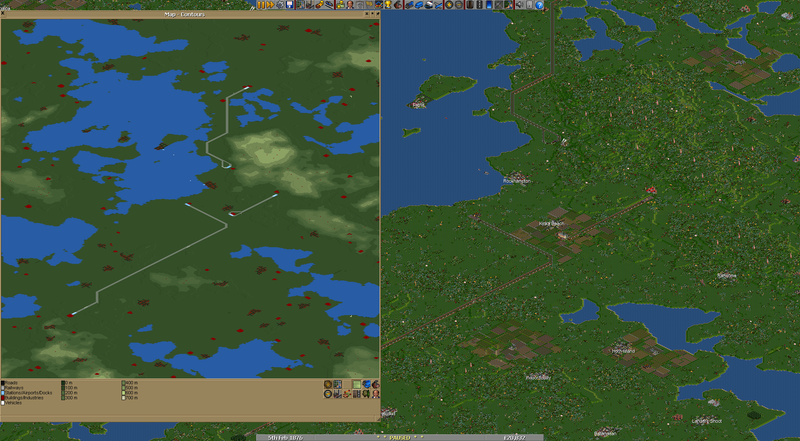 Continuing to move from strength to strength, KTC has extended the southern line to Narita via Kodaira. Extensive road infrastructure has been added to allow a new fleet of vehicles to service the townships in between. A closer look at some of the smaller towns being serviced by the coach link service. Despite initial concern that these would be loss-driving runs, they have proven to be sustainable with signs of turning solid growth over the next few years. A minor change to the company accounting policy for transfer credits cemented them into positive net turnover. Narita is currently the end of line for the southern rail, but that doesn't seem set to last. Minor time-tabling issues look set to drive construction of a rail sidings nearby to allow more thorough servicing of vehicles in between runs. With the huge influx of new passengers and the resultant cashflow, the board of directors are looking to add industrial freight to the schedule. It is unsure at this time how much rail would be shared between domestic and industrial services, but initially at least it will be expected to use existing lines. Some delays are expected, but should not be overly concerning.